You’re in a nightclub, on the prowl… and you spot your ‘ten-to-twoer’. Let’s call them the England football team. Full of beery swagger, and conveniently forgetting you’ve spent all night (the past two years) writing them off, suddenly, they’re pure Hollywood glamour. They charm you with promises of a night (tournament) you will remember forever. You leave the club hand-in-hand, convinced this is destiny calling. You’re all in. The morning after and the confidence is gone, there’s crusty dribble on your chin and your red-carpet catch now resembles… well, Wayne Rooney. 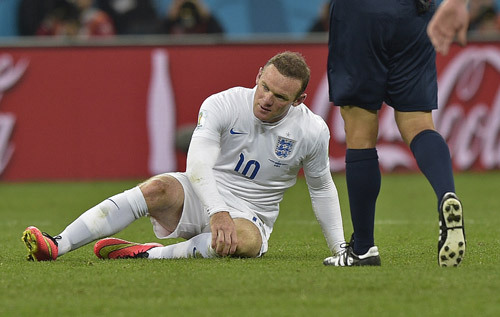 Wazza leaves quickly, feeling equally let down. How could you have both been so fooled… again? Such is the life of an England fan. For two years, we dismiss our players, only to fall in love with them in the days leading up to the first game. The night before, you’re the epitome of flag-waving national pride, only for reality to kick in when the referee blows the final whistle on the game — and your hopes. All this is not an act of choice, by the way. It’s involuntary. Why would anyone put themselves through it time after time? It’s a Groundhog Day-style experience borne out of a subconscious belief that we still rule India and should win the World Cup because, bloody hell, we invented the damn game. Of course, while we struggle to deal with our issues and current status in the world game, the world continues to get better. As the very English Hugh Grant once said ‘A man is an island – and I’m f***** Ibiza!’, which at the least reflects our insular attitude (how many English players ply their trade abroad, for example? ), if not our geography. Of course, being Ibiza would have technically won us another World Cup and a European Championship and made us part of one of the most-heralded teams in the history of the game. But anyway. The truth is that at both ends of the pitch, against Italy and Uruguay, England were outskilled. There is no shame in that. In Andrea Pirlo and Luis Suarez, they simply had extra class. With a tactical tweak here and a bit of luck there, we may have stumbled into the knockout stages from a group that a year ago was acknowledged as a REALLY tough one to get out of. But the brutal truth is, from front to back, we weren’t good enough — and playing Rooney in his ‘proper’ position against the South Americans didn’t alter that fact. We must focus our efforts not just on the heroin-kick provided by the Premier League but on making sure the football pyramid is geared towards getting back among the game’s elite. Right now, though, it’s the hope that kills you. There’s always a sense of betrayal when Jordan Henderson plays like… Jordan Henderson, and not the ramapaging Maradona-esque superhero you were adamant he was an hour before kick-off. The reaction to failure is never kind and one national newspaper’s decision to stick Rooney’s tearful four-year-old son on the front page as a symbol of this tells you a little about the level of the ongoing inquest. Calls to sack the manager and change all the players have predictably followed. No-one has yet come up with realistic alternatives because there aren’t any. We are where we are until we genuinely try to do something about it. As a luckless neighbour told me recently ‘a dog s**** fast, not long’, which sums up England’s past week. Of course, it’ll take us another two years to convince ourselves we’ve cleaned up the mess. And then it’ll be ten to two again. World Cup fan zone: Three down, five to go! June 20: World Cup Diary... They said what?